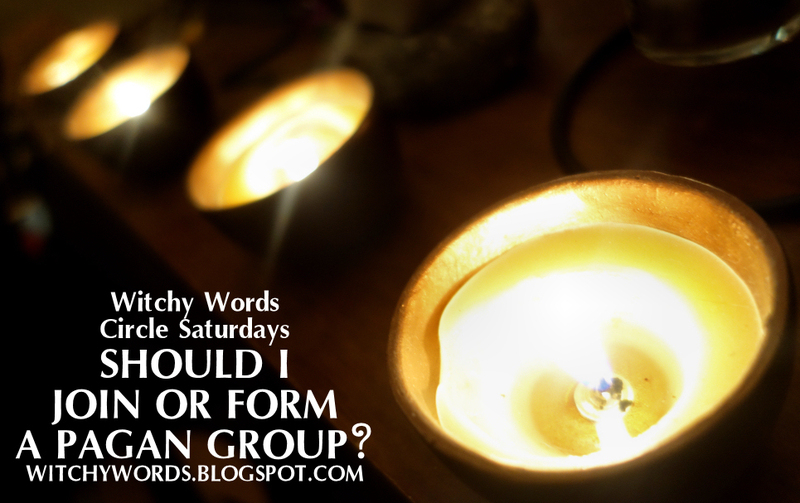 Witchy Words: Should I join or form a pagan group? Should I join or form a pagan group? Am I getting the most out of my religion as a solitary? Is there something more I could do? Should I join or form a pagan group? These questions have likely crossed through every pagan's mind as they think about their place within their religion. For some, the answer is simple: Practicing as a solitary allows for a deeper connection with oneself and one's environment. Spiritual pagans who find the energies of others around them too chaotic, too influencing or too distracting for their work may find that solitary is the way to go. And that's perfectly fine! I hold a deep amount of respect for those who find comfort in practicing without the participation of others. For others like myself, there's something very special about the mixing of energies that makes group practice interesting. It's true that I do practice on my own, but sometimes having a few extra eyes, hands, hearts and souls lends to even greater work than I could manifest on my own. If you think that a group is something you might be interested in, fantastic! But don't go rushing off to find internet listings of the nearest coven to you, or ask your best pagan friend where they practice. There are many things to consider when thinking about including yourself in a gathering. 1. Are you of age to join or form a group? This question applies primarily to those under 18. If you're above the legal adult age for your area, you may skip to number 2. 2. Pagan groups, circles, covens, groves and churches are not to be taken lightly. Joining a pagan group is a serious commitment much akin to applying for a job, volunteer work, adopting an animal or having a child. Groups are nurtured by their members as much as their organizers. Some groups have a hierarchy, which may take some pressure off of you as a member to create, host or otherwise plan for rituals. That doesn't mean that you can blow off meetings, be late, refuse donation, not bring a dish to share or phase out in the ritual. Being on time with a donation and a dish, even in the most easy-going of groups, is a basic requirement. Even in groups that meet without ritual, perhaps for discussion or class, have a certain necessity of commitment. If you form a group, you'll come to expect a level of commitment from the members, so all of the previous still applies. In fact, forming a group takes significantly more effort than joining one. Keep in mind as you begin exploring what kind of groups you'd like to join or form and their bylaws or rules. 3. The group you find must be a good fit to your path. Do your research. Some groups focus on a specific branch of paganism. Some groups focus on a specific god and/or goddess. Some groups are gender-specific. Some groups like to practice skyclad or in specific robes or have a casual dress policy. Some groups are oath-bound and initiatory, meaning that you can't talk about your experience in the group with outsiders, not even to your family. Make sure you have a clear definition of your personal beliefs before you search for a group that shares them. 4. The group you find must be a good fit to your level of education. To further education, make sure you find a group with varying levels of educated members. If you're fresh out of book study, finding an advanced group uninterested in teaching basic members will frustrate you. For a study group, try to find members with varying interests. If you're trying to branch out on your knowledge and skill set in, say, divination, you'll be disappointed if everyone in your group only knows tarot. A group that's too advanced may cause you to be confused, disorientated or even simply leave you behind. A group that's not advanced enough may cause you frustration and not allow for the spiritual growth you seek. 5. The group you find must be a good fit for you. If you are of age and can take group participation seriously, you must also feel comfortable above all else. If you cannot talk to your group members, find them bickering or otherwise feel uneasy, this is not the group for you. Not every group that you find will be a good fit for you. Not every group that you find will see you as a good fit for them. Good groups promote harmony, communication, positivity and growth. Seek these out while you search. As I said in number 1, most groups and people have your best interests in mind but some do not. Particularly in this day and age where we often meet many people online first, you must be careful! Have your first meeting with the primary members of that group in a public place and preferably with a friend or family member. Ask to see the group's bylaws, rules or other regulations. Talk about the location of practice and see if you can attend a ritual or meeting without fully joining just to get a feel for it. It will let you know quickly if this group practices safely with positive energy and good connections to its members. I'll repeat what I said in number 5: Good groups promote harmony, communication, positivity and growth. You should see this reflected in the group's laws, meets and conversations. When joining or forming a group, there are some signs to keep an eye out for. These signs may be early warnings of unsafe groups, inexperienced groups or groups that are otherwise unfit for you. 1. Groups that are overeager to have you as a member. The group should be excited about you joining, but you should never feel that they are desperate for members. This goes triple for anyone under 18, or any potential member who sees active recruitment of those under 18. Get out quick. 2. Groups that bicker among themselves. If there is no harmony within the already pre-established group, you may find yourself caught up in it as a member. 3. Initiation requirements that make you uncomfortable. This applies directly to number 5. If you're uncomfortable with any part of the initiation (or any part of the group in general), then do not join. 4. Leaders who seem uneducated about their religion or rituals. If they don't know what they're doing, how can they lead you? 5. Power-hungry leaders. These types of leaders are often leading a group for some sort of personal gain. They're not truly interested in spiritual growth, community or harmony - just control. 6. Groups that ask you to sever ties with your family, friends, significant others, money, belongings, home, job or other parts of your life. While a group is a commitment, it should not be your entire life. Groups that ask you to do anything that goes against your way of living is a terrible fit. 7. A group that asks you to go against your morals or even break the law. Clearly, this group doesn't have your best interests in mind. While much of what I've talked about in this article refers to joining a group, it should also be applied when forming one. Potential group members should always be over 18, serious about the commitment, a good fit and practice safety. Never ask group members to do anything they're uncomfortable with or that goes against their beliefs, the law or puts them in danger. Be mindful of everyone's beliefs, of what you say and of how you lead. Mistakes are made. They happen. Don't stress yourself on being a "perfect" leader or a "perfect" member, but do your best to be fair. That's probably the most important part of joining or forming a pagan group.